I realize that all these printables can add up, so I compiled a list of tips to help save costs for all the alphabet packs and other printables I provide on this blog! Double your money! Put 2 sheets back to back and run through the laminator. When you cut them apart, the lamination is on the front but not on the back. You can still use for dry-erase, and it still helps with durability! Office max and Office Depot run free lamination days! Check their websites to see when! Check your local teaching supply store, mine has laminating for .19/foot and its 24 in wide. I own a Xyron 900 9-Inch Creative Station, you might be able to find deals on ebay and maybe craig’s list for your area. Xyron 900 Two Sided Lamination Refill Cartridge: here is a link to Amazon so you can see it, but I usually get them from Michael’s or JoAnn’s and use a 40% off coupon! As an alternative to laminating, you could always leave the pages whole and place them in 3-ring binder page protectors. They can still be used with dry-erase, and you can re-use them for each letter you do! Another alternative Laminator that I’ve heard people like is the Scotch Brand Laminator from Wal-mart approx $26. And they sell Scotch laminating sheets (50 sheets for $13.88) at Walmart as well, and packs of 200 sheets at Sam’s for $21. Clear Contact Paper: I’ve heard some people using this for lamination, it’s not as durable, but does work with the dry-erase markers. I just take off the key ring binders after we’re done with a letter and re-use them on the next one, so I don’t have to buy tons of them. Makes for flatter storage of letter activities too! If anyone finds something less expensive, leave a comment, we’d love to know! I provide numbers for each letter set for first timers, but really you could just use the same numbers for each letter, saving time cutting, printing & laminating! 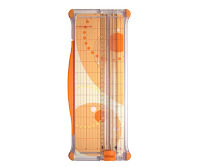 I use a Fiskars Personal Trimmer to do most of my cutting, faster and easier! Look at the pdf’s before printing, you may not need to print all pages, while I provide small counters for the games, wherever possible I like to use 3-D manipulatives instead, for example we used real m&m;’s for counters during our Letter M activities. I use file folders to store all the alphabet activities in. Store in large plastic container, or cardboard box. Click here to see how I store them for now. That’s it for now, I’ll add to this list as I think of things, and if any of you have found ways to save money on school supplies, leave a comment and I’ll add it to the list! thank you! I am going to have to check out those free lamination days at office max/depot. I'd just call your local store and see when they are, might not list it on the website until its happening! It certainly can get expensive when you are making your own resources.Instead of laminating, I sometimes use contact (although it is not as durable), but it still preserves resources and you can still use a dry erase marker.I also use Overhead Transparency Sheets which I put over worksheets so that they can be re-used.Thank you for sharing your cost cutting tips. My sister just introduced me to your blog and I LOVE it!!! Thank you so much for writing and for making all of your wonderful resources available.I REALLY want to find a laminator on the cheaper side. Until then I use the clear contact paper. Not too bad. It'll keep me happy until that perfect laminator comes along :)Also, I buy our white cardstock at Big Lots. It's 2 bucks for 75 sheets. Thanks again!!! I bought my laminator at walmart, its the scotch brand, 26 bucks. the 8.5×11 sheets are 13.88 for a pack of 50. We have downloaded most of the activities from letter A and B, along with lots of the other stuff you make available, and I just now had to buy a new pack. I cut my stuff first, then laminate, squishing things onto the page as many as will fit! :PThank you so much for making all of this available, it really helps me to see how other people homeschool. And I love that its so colorful (I bite the bullet and pay for the extra ink, too)! I am getting in late to this post but I wanted to share. If you have a Mardel in your town, they have the regular sized laminator machines. You do feed things through youself but it's $0.25 per foot. I just downloaded all the pages for 3 letters of Erica's and laminated most of the pieces. PLUS I ran through several feet of file folders that I made into mini-offices for my K and 1st. I also had several games that I laminated. The whole thing cost me $12. I know that Mardel is not in many places but if you have one near you it comes in handy. I am going to have to check out the free lamination days. Of course, will all the I stock pile to laminate they may cancel those days. HA. I hate the feel of paper so I laminate (or use page protectors) for everything. Thank you for the tip about doubling up on laminating. What a great idea! I just wanted to share that laminating sheets are extremely cheap at http://www.laminator.com. They are always Buy 2 packages get 1 free. A package of 100 3mil. thick laminating sheets is $15.99. So far that is the cheapest I have found. I buy laminating sheets on amazon for $9.99 (100 sheets). They are the 3 mil size. You have such great resources! I usually use them all and have a laminator. I too have the Scotch one from Walmart… $26, I think. Well worth the money! I was buying the Scotch laminating sheets (50 sheets for $13.88) at Walmart as well, but then found a pack of 200 sheets at Sam's for $21! Can't beat that!I'll have to look into the free laminating days for the bigger stuff, though. That would be a great deal if you can catch it right!Thanks for your awesome site! It's really a life saver!